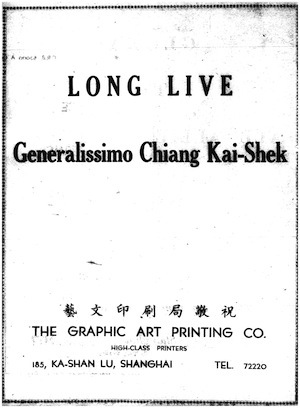 Fig.1 'Love Live Generalissimo Chiang Kai-shek!' 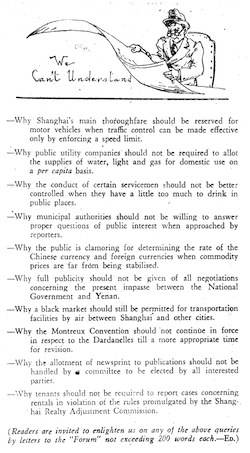 Victory slogan advertisements like this frequently appeared in the pages of The China Critic in its last year. In November 1940, this journal acted upon 'advice' and suspended publication. Today it makes its appearance again. The lapse of five years will not change the policy which it pursued for more than a decade. On account of lack of printing facilities, high cost of labor and newsprint and absence of most of our regular contributors, only a skeleton edition is offered. As soon as circumstances permit, it will be our earnest desire to restore this journal to its full stature. At its peak in the early to mid 1930s, The China Critic was regularly thirty pages long. This issue contains just six pages of editorials and special columns. Personally I hate war as much as any sane person, and I do not talk about the atomic bomb lightheartedly or callously. Yet to me the atomic bomb is up to the moment the most practical means to outlaw war and to restrain any nation from going to war… . With an international organization for peace as envisaged at the San Francisco Conference and with an effective weapon like the atomic bomb as the safeguard, mankind may feel at ease once again. Indeed, the atomic bomb has brought peace to the world; it may keep the world in peace. Fig.2 'We Can't Understand', 6 December. 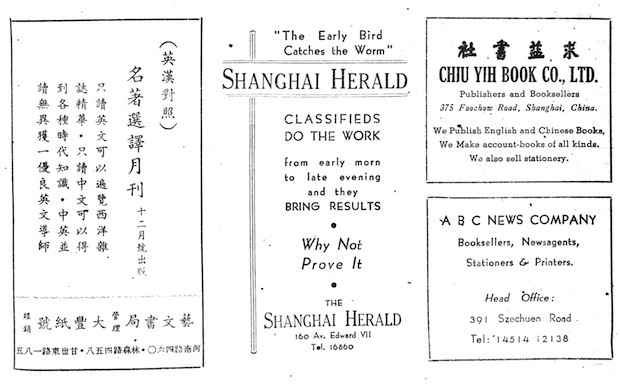 This year The China Critic called for readers to contribute to such advertisements for the Contents page. As consul in the Philippines [Chu] was known to have earned the admiration and gratitude of the overseas Chinese whose interests he endeavored to promote. When the Pacific war broke out, he could not help giving full expression to his patriotic spirit and in consequence incurred the full wrath of the Japanese invaders. You will hear 'freedom of speech' shouted by long-haired demagogues from one soap-box to another. And pretty soon in a moment of sane quietude, you will ask yourself what all these slogans mean. They do not mean a thing as long as they remain slogans. Freedom of speech is not a gift all wrapped up and ready for use which comes just for the asking and slogan-yelling. It is something to be worked for, for which we must make sacrifices. 'Die-hards Go Home' describes a new breed of foreign chauvinists 'who have emerged from concentration camps and discovered a new set of circumstances not to their liking'—the end of extraterritoriality laws.The writer of this Editorial includes a number of 'quotations' from interviewed die-hards, which sound rather spurious: ' "We can't give China freedom", says one of them, "We have done so many wrongs in the past that once given a free hand she may try to get even with us" '. On this day of days, the nation may proudly rejoice over the dual event of overthrowing an alien rule lasting 300 years and conquering a traditional foe of fifty years standing. The Sleeping Lion has at long last awakened; its roar echoing and re-echoing throughout the universe and will continue to echo for centuries to come—if the people will at all times bear in mind the lessons that the history of 100 years of humiliation has taught them, and if they will keep the nation in a state not of stagnation but of revolution, peaceful but virile, constructive and not destructive, with malice to none but with goodwill to all. In his article 'New Intellectual Ferment in China—Part 1', the first of three, C.Y.W. Meng 孟張泳 discusses a healthy appetitefor 'Spiritual Food'—magazines, books and new translated biographies of world leaders—among Chinese readers. Meng also describes the insatiable demand for English dictionaries and conversation books, 'not because of the demand for "Interpreters" for the Allied army in China, but because of one distinct reason—the world-mindedness of the Chinese youths'. With regard to contemporary Chinese literature, Meng contends that Ba Jin 巴金, Guo Moruo 郭沫若 and Mao Dun 茅盾 'are the best writers in China' in the mind of the reading public, citing a number of their works which are particularly popular. This term consists of the two component parts of the Chinese character 兵 Ping'—a soldier. When the English and French speak of their "Tommy" or "Poilu", it is with a feeling of familiarity if not endearment, but when Chinese speak of their "Chiu-pa" however, it carries a sense of disrespect and even contempt. While not officially a 'special issue', this week's The China Critic—now with 'More Pages with New Features Added'—contains a number of articles about education. The Editorial 'The Need for Educational Reform' describes a number of problems confronting educationalists in Shanghai, including the need to reopen universities, to establish a 'Student Aid Fund' for the support of poor students, and to reconsider the rote-learning style of education: 'Nobody bothers to find out of he understands what he learns—it is not even considered important'. C.L. Kwei 桂質良, 'In her varied capacity as a mental hygienist, a mother of adolescents and a teacher in secondary schools', offers a critical survey of the problems particular to educating young adults in herspecial article 'Adolescent Education'. Next to political unity and economic stability, there is the immediate need of nation-wide education reconstruction, about which nothing definite has been announced … education, being the most basic of all constructive forces, merits our gravest consideration. [Mental hygiene] is the science which analyzes, correlates and integrates the various influences and drives in an individual to fit them into a harmonious whole. It accepts a person as he is, with his particular heredity, environment, and his intellectual and emotional make up, and tries to understand why he behaves the way he does, in order to guide him to a richer and fuller life. 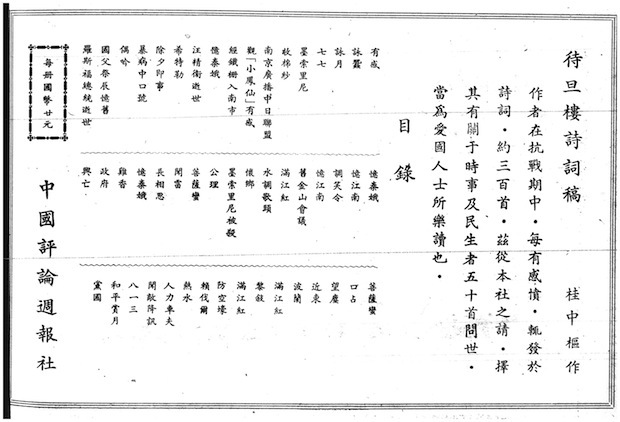 Kwei proposes a three-part plan for implementing this education, which consists of 'child guidance clinics where parents, kindergarten and primary school teachers may seek information'; 'mental hygiene lectures in all high schools'; and a 'special consultation service' for college students, pre-marriage couples, expectant parents and middle-aged women. Some of Lin Yutang's most celebrated 'Little Critic' and Analects Fortnightly essays spoke of the joys of smoking cigarettes. In this final issue of The China Critic a writer by the name of Peter Chang takes up the theme with an essay titled 'Cigarettes'.